Jochen Rindt made it four wins out of four with victory at the German Grand Prix, a result which gave him a commanding lead in the drivers' championship and left observers doubting anyone had the firepower to match the Lotus 72. 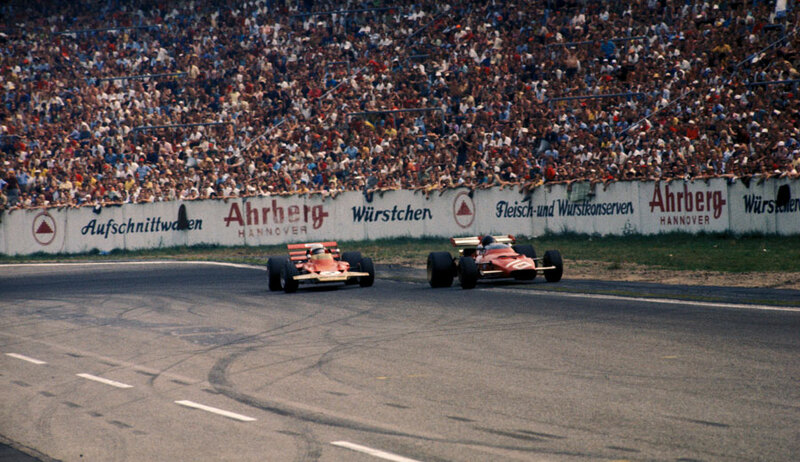 The race was due to be held at the legendary Nürburgring but was switched to Hockenheim a month beforehand after drivers refused to accept enough had been done at the Ring to make it safe enough in the wet. The drivers' stance was not universally welcomed, with those unhappy with safety standards slammed as the "milk and water brigade". Those moaning probably did not spend much time worrying about the 17 drivers who had been killed racing so far in 1970, the last being Herbert Schultzle at the Nürburgring - the third of the year there - a week after the cancellation of the grand prix. Rindt's win came at the end of a gripping race in which he had battled hard with the Ferraris of Jacky Ickx and Clay Regazzoni, and the March of Chris Amon. These four pulled clear of the field and all remained within a few car lengths of each other for much of the grand prix. Ickx and Rindt swapped the lead although Regazzoni briefly took over for two laps before he spun and stopped with gearbox trouble. Four laps later Amon's day ended when his engine failed. At two-thirds distance Rindt led Ickx by less than a second, with John Surtees 37 seconds adrift in third, and the lead continued to change hands every couple of laps. Surtees' hopes ended four laps from the finish when his engine also blew. At the start of the last lap Rindt was barely a car length ahead, but his speed advantage on the straights enabled him to win by 0.7 seconds even though Ickx set a new lap record on the final circuit. "It was the hardest race I have known," Rindt said. "It was anybody's battle but I was anxious to prove my V8 engine could beat the 12-cylinder Ferrari. But Jacky and I fought sportingly and I had to pull out every stop to win."